Home to more than 1,500 acres of vines, the East (Willamette) Valley is a quarter century-old winegrowing region raising winegrapes for many of Oregon’s largest wineries. The East Valley is part of the northern part of the Willamette Valley. Its boundaries consist of approximately Oregon City in the north, I-5 corridor to the west, Aumsville to the south and Molalla to the east. More than a dozen boutique wineries in the area are members of the East Willamette Valley Wine Association, also known as the East Valley Wine Tour. Focus? Our group’s main focus is collaborative as well as promotional. Our members collaborate via tastings and discussions on winemaking as well as marketing (distributor experiences, pricing, sales trends). All members involved participate in comprehensive advertising via print and festivals. Identity? Our group is a young (less than 10 years), flexibly joined collage of vineyards and wineries in the Willamette Valley’s East Valley reaching from West Linn south to Aumsville, a mere 40-mile stretch between the northernmost and southernmost estates. Still, we have made strong inroads into Oregon’s wine tourism and continue to be “discovered” as a fun and diverse destination. Varieties? Undoubtedly, some of Oregon’s highest scoring Pinot Gris is sourced in the East Valley. In fact, there are two members of the East Valley, Christopher Bridge Cellars and Pudding River Wine Cellars, that are part of the current campaign for Oregon Pinot Gris (www.oregonpinotgris.org). Even so, our Pinot Noirs rival some of the Willamette Valley’s best, as well. With our cooler Cascade foothills microclimate, our other white wine varietals, i.e. Muscat and Sauvignon Blanc, are also showing promise. Collaboration? The group continues to build on years of collaboration via regular meetings. A dedicated group of members spearhead advertising, collaboration with community leaders, individual support and feedback as well as dissemination of information for all group members. Challenges? 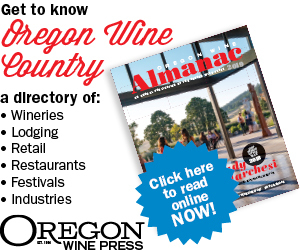 We continue to strive toward better recognition of our winegrowing region as members of the larger Willamette Valley AVA, but both geographic distance and (low) member numbers currently present challenges in demonstrating a rise in quality in the wines produced here, as well as creating a larger momentum to organize and produce events and attract media to our area specifically.We have long talked about the need for our own AVA classification. Getting our own AVA would create a foundation of reference for media or consumers looking to identify Oregon’s wine regions. Segmenting our region apart from the northern part of the Willamette Valley AVA would also help identify the microclimates and unique attributes of our area, adding value to our ventures. Marketing? Most dollars are spent on our bi-annual brochure printing (20,000 copies) with the remainder going to the New Release Festival and website maintenance. Social media is important to our individual winery efforts, but this is one of the areas in which we are lacking. The challenge with social media is that it’s a full-time job, and we barely have the resources to manage our own social media efforts.